OneDrive for Windows Phone has received a significant update today, bringing several new features to the cloud storage app. The new update, version 4.7 for those keeping score at home, is available now in the Windows Phone Store and brings four key updates that continue to level the playing field between the Windows Phone version and iOS or Android versions of OneDrive. The first new feature is PIN lock support. Now in OneDrive for Windows Phone you can setup a 4-digit PIN which will be required to access your files. It is an added layer of security so if your device is lost or stolen, you have one more barrier for thieves to get through to get to your OneDrive files. Obviously you should make sure the 4-digit PIN for OneDrive is different than the one you use to unlock your phone outright. The second big update comes in the Photo Albums in OneDrive for Windows Phone. To this point you have only been able to create an album or move files within them via the OneDrive website. Now you can do that from the app itself. You have a much improved viewing experience with larger thumbnails but now you can create, view and share albums easier than in the previous version. In fact you can create an album using pictures and videos from anywhere in your OneDrive, not just the Pictures folder. Third is multiple account support. 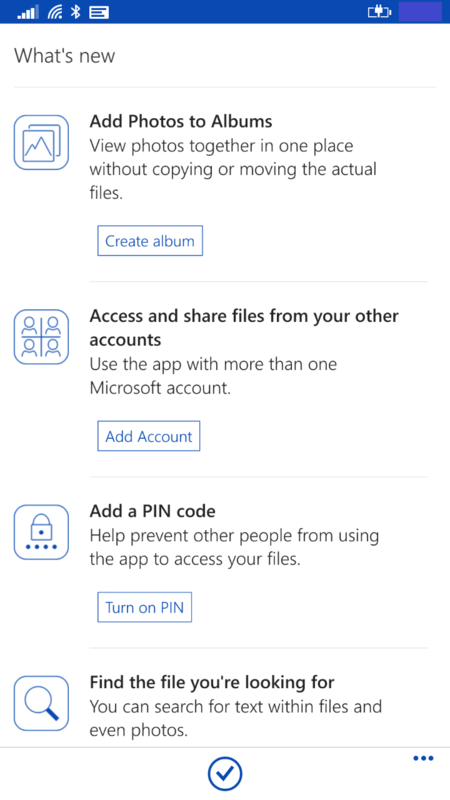 If you have more than one Microsoft account you can now access these multiple accounts from within the OneDrive app. Let us say for example you have a OneDrive account for your personal use and another for school use. Now you can log into both accounts within the OneDrive for Windows Phone app and seamlessly move between them to get to your files and other content. Finally, there is greatly improved search functionality. Now you can search for text within files and even photos stored in OneDrive so you can find that file faster and more accurately. The updates and improvements in this release are certainly welcome and bring changes that a lot of OneDrive users have wanted for some time now. The PIN lock is of particular importance to me but the new ability to create albums without having to go to my PC or tablet is great to see as well. OneDrive for Windows Phone is a free app and available now in the Windows Phone Store. If you are not a OneDrive user, now is a great time to join. Signing up with get you a free 15GB account but as I outlined last week, there are ways for you to get over 200GB of storage free with current promotions (some of which end at the end of February).